5 GSU cops interdicted – they roughed up top cop’s wife! Amandala has confirmed that five officers attached to the Gang Suppression Unit (GSU) are currently on interdiction for allegedly assaulting the wife of Assistant Commissioner of Police Allen Whylie. We were unable to confirm the names of the officers, and the date of the incident. 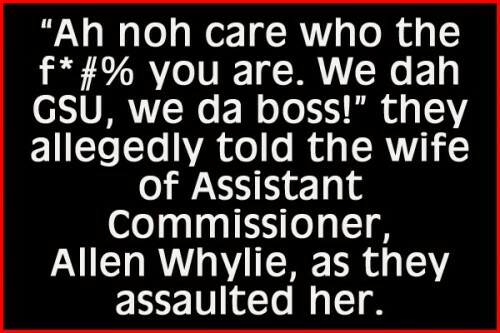 However, we were reliably informed that Mrs. Whylie witnessed the officers abusing a youth who was already handcuffed. She allegedly told the officers that there was no reason to “chance” the youth, since he was already restrained, but the officers became indignant and turned their negative attention on her. We were able to confirm that following the incident 2 corporals, 2 constables and a woman police constable were placed on interdiction and have been for at least two weeks now.